I love going to Italian restaurants and ordering chicken marsala. Unfortunately, though, it can get a little pricey after a while. That’s why I decided to learn how to make it at home! Not only did I find an amazing recipe, but I found one that rivals my favorite Italian place. 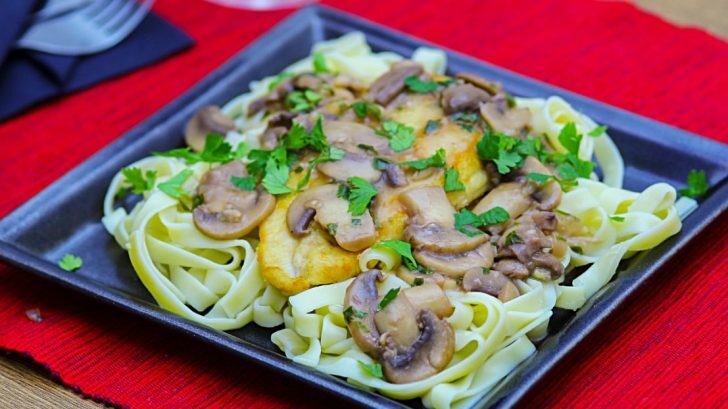 Could this be the best chicken marsala ever? You decide… make it yourself! Start by washing and slicing your mushrooms. Then, grab your chicken breast and butterfly it. Tenderize it with a wooden mallet until it’s an equal thickness. Cut the chicken breast in half. Take your flour and season with salt and pepper. Coat your chicken breast in the flour. Fry it up in the oil on both sides until the chicken is cooked. Once the chicken is out, add your mushrooms. Sauté the mushrooms for a bit, then add your wine and lemon juice, followed by your garlic, butter, and parsley. Cook until reduced and thickened. Add your chicken to a bed of cooked pasta, then pour your sauce on top. Now you’re ready to eat!